– Professional experience in a variety of roles, settings and Lightweight and Membrane Structures. – Complex 3D structural modeling/analysis including AutoCAD, WinTess, basic EasyCAD. -Ability to work both independently and with a team, and deep knowledge base. – Research in SMiA Group – Structural Morphologic in Architecture, Lita/ETSAV-UPC Barcelona, Spain. – Lightweight-Structures Fellowship: ILEK Institute, Stuttgart, Germany. under the direction of Josep I. Llorens and Ramon Sastre. – Conference presentations: USA, UK., China, Germany, Serbia, Belgium, Italy, Spain, Chile, Venezuela, Ecuador, and Colombia. -Published: IASS, IJSS, Cimne, Tensinet, and SEWC. ILEK Institute – University of Stuttgart – Fellowship: “PhD. Research in Lightweight and Textile Structures”. ETSAV–SMiA Group (2013). – Research in Lightweight – Textile Structures and Parametric Structures”. projects and workshops including performing lightweight-structure design and analyses. – Collaboration with Architect Martin Oliu designing hotels in Shanghai, China. La Velería de Vilanova i la Geltrú (2009). Consulted on textile-architecture projects. retirement homes, and industrial settings. ETSAB–UPC (2001-2004). Collaborator – Department of Architectural Construction with Alrun Jimeno. – National University of Colombia: design of new buildings and social-housing projects. – Collaborated on urbanism projects, public space, housing, and rehabilitation projects. 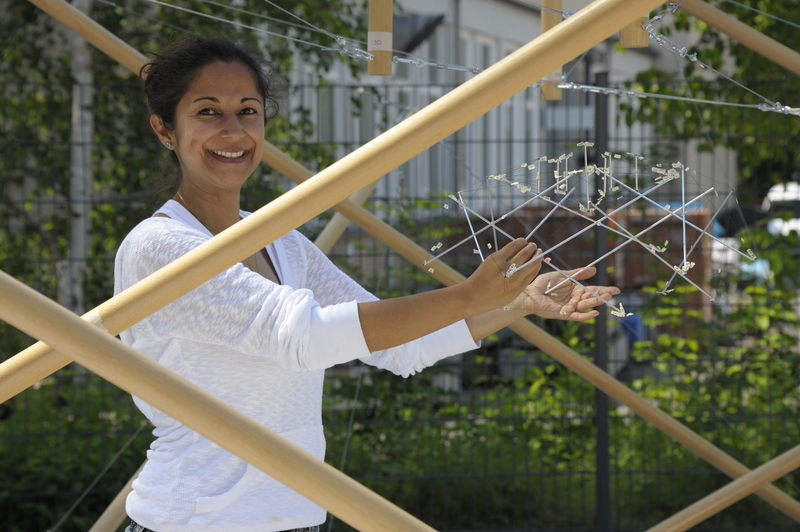 Application of Tensegrity Principles on Tensile-Textile Constructions. – IJSS International Journal of Space Structures Vol.25 Nº1. ISSN 0266-3511. Editor Rene Motro. Multi-Science Publishing Co. Ltda. UK., 2010. – Textile Composites and Inflatable Structures IV – Structural Membranes. ISBN 978-84-96736-70-2, Cimne International Center for numerical Methods in Engineering. Editors E. Oñate, B. Kröplin. Stuttgart, Germany, 2009. – Evolution and Trends in Design, Analysis and Construction of Shell and Spatial Structures. ISBN 978-84-8363-459-2. 50th Anniversary Symposium of the International Association for Shell and Structures IASS. Editors A. Domingo y C. Lázaro. Valencia, Spain, 2009. Application of Tensegrity Principles on Tensile-Textile Constructions: Formfinding and Analysis. – IASS International Association for Shell and Structures. Vol.52 No.2 ISSN 1028-365X, 2011. Form finding and Structural Analysis of a Tensegrity Dome. – Tensile Architecture: Connecting Past and Future. Editors Heidrun Bögner-Balz y Marijke Mollaert. ISBN 978-90-9025666-5. UACEG University of Architecture Civil Engineering and Geodesy. Sofia, Bulgaria, 2010. – Spatial Structures – Temporary and Permanent. ISBN 978-7-112-12504-3. International Symposium of the International Association for Shell and Structures IASS. Editors Q. Zhang, L. Yang, Y. Hu. Shanghai, China, 2010. Tensegrity for a Sports Arena. – SEWC Structural Engineers World Congress. Editor L.E.G.O. spa – Como, Italia, 2011. Tensegrity Ring for a Sports Arena: Form finding and Testing. – Textile Composites and Inflatable Structures V – Structural Membranes. Cimne International Center for numerical Methods in Engineering. Editors E. Oñate, B.Kröplin and K.-U.Bletzinger. Barcelona, Spain, 2011. – V Latin American Symposium on Tenso Structures, School of Architecture – Catholic University of Chile. Santiago – Chile, 2012. – Proceedings of the IASS (Association for Shell and Structures) & SLTE (Simposio Latinoamericano de Tensoestructuras) Symposium: “Shells, Membranes and Spatial Structures: Footprints”. Reyolando M.L.R.F. BRASIL and Ruy M.O. PAULETTI (eds.) Brasilia – Brasil, 2014.